In 2011, a small group of lavender growers and crafters came together to address a need. There were several regional lavender associations, but no national group. An association at a national level was seen as needed by many. After the first meeting in June 2011, the Organizing Committee was formed and a Temporary Board established. The mission and name were decided on and the work began to bring this association to life. Many hours were volunteered and monies donated by this dedicated group. The permanent structure and initial Board were placed and the launch for membership began on April 27th, 2012. 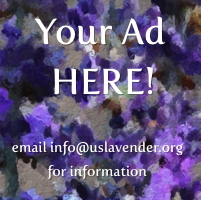 The USLGA has both a local and broad vision with anyone interested in lavender being welcomed to the association. We look forward to having you join us in the USLGA!